The last Nizam of the former princely state of Hyderabad in South India was the richest man in the world in his time. Accounting for inflation, his fortune still ranks as one of the world’s all time highest. The Nizam was no mere ‘His Highness’ but rather ‘His Exalted Highness’. For all his wealth, the last Nizam is said to be a miser, eccentric in many ways. He was even on the cover of Time magazine in 1937. As the Nizams before him, he too expected only the best food to be served at his royal table. These rulers of Hyderabad, had between the 15th and 19th century, perfected the art of cooking. They took the princely Mughlai cuisine and blended it with the spicier South Indian fare. 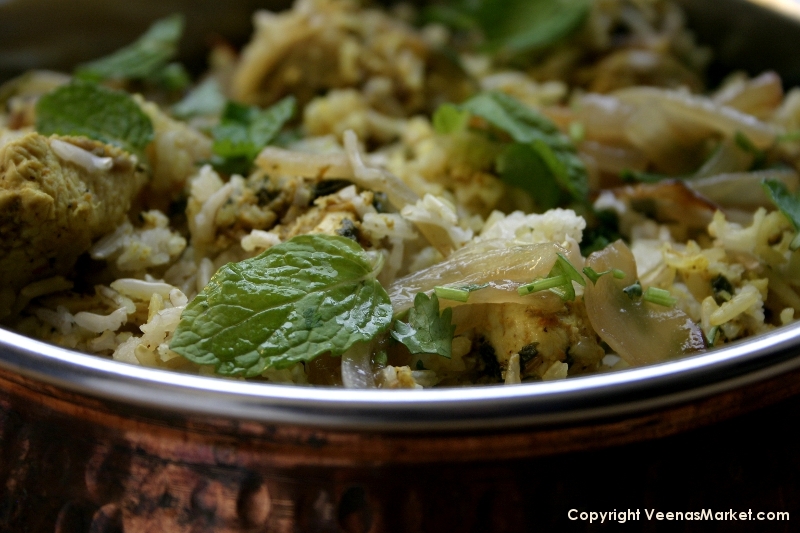 Their rendition of the Persian dish really resulted in the birth of biryani as we know it today. While most of the restaurant biryanis on offer all taste more or less the same, there are in fact many kinds of biryanis. The chefs of the Nizam are reputed to have 49 biryani dishes, the recipes for which were closely guarded. With this historical background in mind, I felt audacious taking this popular dish and remaking it to fit my dietary needs (brown rice instead of white) and to ease the prep work in my decidedly non-royal kitchen. I also used chicken instead of the more authentic goat meat just because it is so much easier to find. 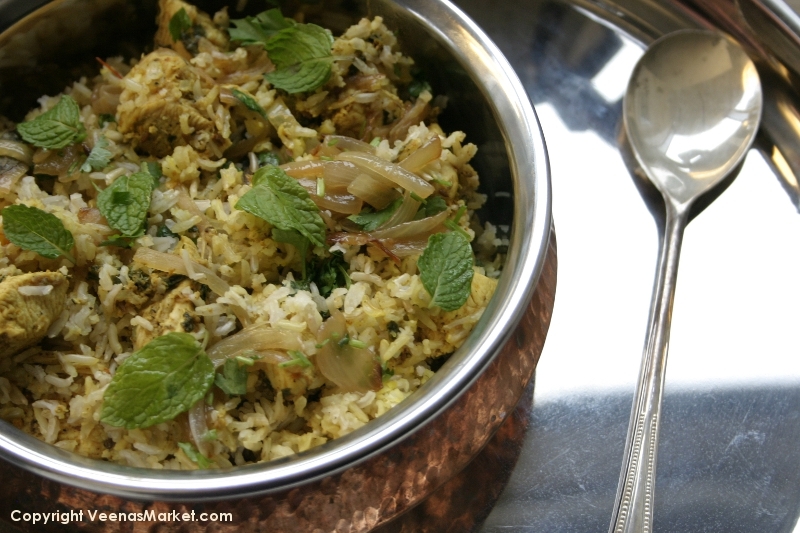 The method that I used to cook biryani is a mash-up of the slow cooking Hyderabad style and the get-it-done already Lucknow style, another place in India famous for its biryani. Even still, this is likely one of the more complicated recipes on my blog. If you have questions, please post them as comments. I’ll try my best to answer them. Put rice to soak in a steel pot for at least 1 hour. Don’t forget to add the salt. Mix the marinade ingredients together except for the chicken. Taste and add more salt if necessary. Mix in the chicken. Cover and refrigerate for at least 45 minutes till ready to use. Prepare the onion garnish. Heat 4 tablespoons oil in a large skillet (or wok). Saute onion over medium-low heat till brown and nicely caramelized. Adding a big pinch of salt with the onions helps reduce the cooking time. Stir occasionally to prevent uneven cooking. This whole process should take about 20 minutes. The longer the time the onions take to cook, the better the flavor. Place the cooked onion in a bowl lined with paper towels to soak up the excess oil. When the rice has soaked for an hour, heat the pot over high heat. Once the water starts coming to a boil, lower the heat to medium low and simmer for 8 minutes. Cover the pot while simmering. Once the timer goes off, remove from heat, strain the rice and put aside. The rice should be half cooked. You could also start the next step in parallel while waiting for the rice to cook. Next prepare the base. Heat the ghee or oil in a large thick bottomed pot over medium high heat till a cumin seed thrown in the oil sizzles. (You can use the same pot to bring the whole dish together at the end and reduce your cleaning!) Fry all the whole spices for 10 seconds or till you smell the aroma of the cumin seeds. Immediately add the chicken with all the marinade. Give everything a quick stir and reduce heat to medium. Have a lid handy in case of splattering. Let the chicken sauté for 3 minutes or till all the pieces are slightly cooked (opaque) on the outside. If you cut open a piece, it should still be pink on the inside. Remove from heat immediately. At the point, you should have a pot of half cooked brown rice and a pot of half cooked chicken. Now comes the fun part! Remove 1/3 of the chicken and put aside. Into the same pot as the chicken, add half the rice as a layer above the chicken. 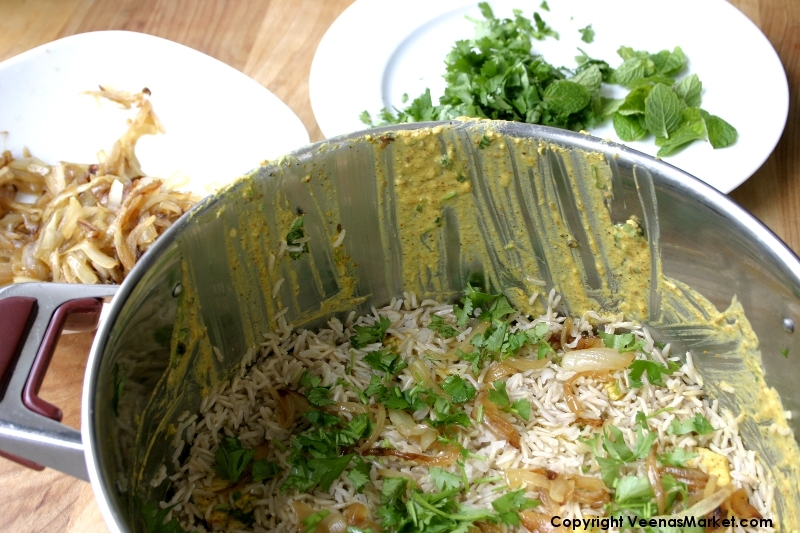 On top of the rice, sprinkle part of the cilantro, mint and caramelized onion. Add the rest of the chicken as a fourth layer. Make a second layer of rice on top of the chicken. For the last layer, add the rest of the onion, cilantro and mint, saving a little bit to use as fresh garnish before serving. Now your pot with all the layers is ready for its final step. Cover the pot immediately with a tight fitting lid. If you don’t have a tight fitting lid, cover the pot with a thin towel and then with the lid to form a tighter seal. This is important since the chicken and rice need steam to finish cooking. Turn on the heat to a very low setting. I use ‘1’. Let your stove come up to heat and then place the pot on it. Turn on the timer to 30 minutes. Both the chicken and the rice should be perfectly cooked. Tue Indian basmati rice means a trek to the Indian or Asian grocery store. You’re probably wondering why you can’t substitute another brown rice or use American brown basmati rice. 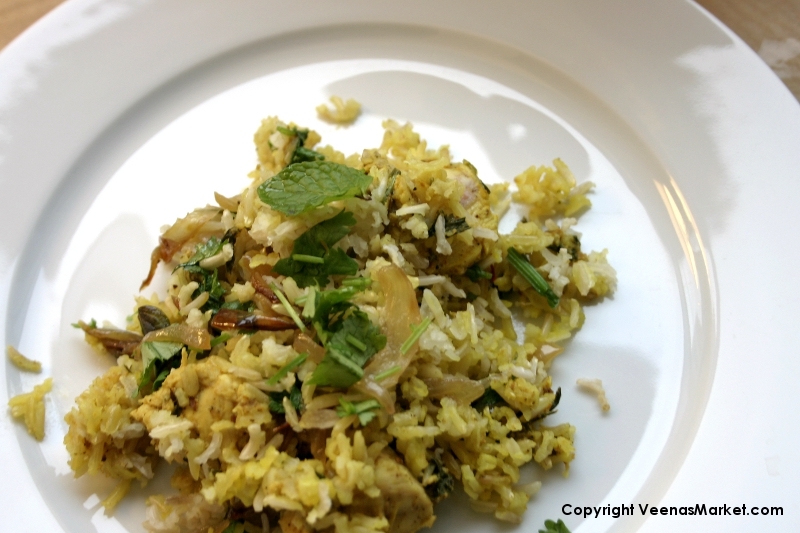 The true basmati rice has an amazing flavor and when cooked, stays fluffy and elongates. None of this is true of the ‘American’ basmati which really should not be allowed to use the name basmati. So you *can* use a different rice but if you do, please be warned that cooking times will vary. Your biryani will still be edible but it won’t be quite as good. I know because I’ve tried it with brown basmati rice from Whole Foods and Indian brown basmati rice. Huge difference. I highly recommend using ghee rather than oil in preparing the base. Or at least a mix of the two. Many recipes call for red coloring. 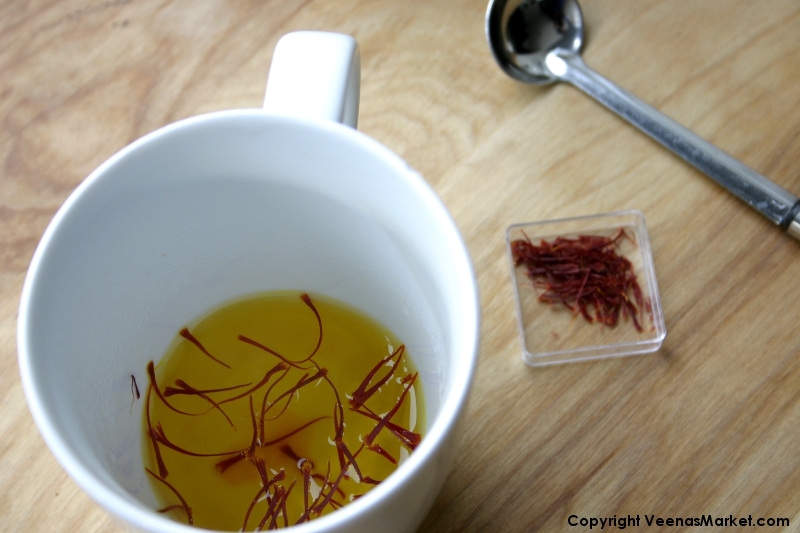 I refuse to use artificial flavors and colors in my cooking (or in my recipe kits) and prefer to make food look pretty with garnishes or natural dyes like turmeric or saffron.